Assemblyman Dinowitz and I met last week in his office about traffic mitigation issues on the Deegan and this. Very happy to see this. I am sharing it here as it was just posted in my advocacy group. But what's the threshold for legislative override - 50%+1, 60%, 66%? And will there be actual dedicated state aid and funding ratios for and upstate transit authorities? This is a step in the right direction, which is what’s important here. I’ve spoken personally with several elected officials about this, and ultimately congestion pricing is the next step come January. I wasn’t expecting this to happen since it’s usually dead politically this time of year, but this definitely sets the stage for what is likely to happen in 2019. I’ve spoken with Marty Golden about this in his office when we met earlier this year, and Assemblyman Dinowitz last week during our meeting, and the same thing keeps coming up. Congestion pricing in some form will likely happen. The particulars have to be worked out but, this is the deal. I hate CP - since it's a sin tax on folks who live on LI - geographically, but whatevs. Although I'd rather NYS actually create a transit funding scheme out of its revenues for all the state's transit agencies - since they're in such a woeful state because of NYS intransigence and not because of riders. This is definitely a great start! My worry with congestion pricing is that the price of goods in the city will rise dramatically if delivery vehicles are charged high fees. I know the city experimented with incentivizing overnight or off peak deliveries, but that has not been a rousing success from what I've seen. I hope they figure that issue out. Reality is a bit more complex than it being a regressive tax on suburbia (though, I'm by all means for encouraging people to move towards transit). I can't find the data right now (it's in this database, and like an idiot I forgot to export all those years ago), but a solid majority (if not a super-majority) of LI-Manhattan commuters use LIRR. Car mode share is high in suburbia because intra-suburban commuting is the norm in suburbia -- IIRC about 75% of all Long Islanders work in Nassau or Suffolk -- and transit is a$$ at serving those folks. Don't take suburban mode stats to be indicative of commute patterns in markets served by transit. It's not commute patterns I'm focused on with my hate for CP - it's the folks who want to leave LI/Q/Bk for anywhere else in the US in their cars that I'm on the side of. Leaving LI before CP has two options: Manhattan congestion over the free bridges, or toll crossings. Right now they have options - tolls are faster, but Manhattan is free. With CP, when they define peak periods like PANYNJ does - 5am til 8pm at minimum (possibly 11pm cuz you know how NY is), you're now forcing anyone who wants to go anywhere beyond Manhattan to pony up $$. I find that to be morally wrong, since it turns anyone on that landmass to become an ATM. Just like it is with SIers. Just like how I dislike that there's two toll freeways/expressways to go from Northern NJ to anywhere South (GSP and NJTP) - otherwise it's two-lane or divided roads with stoplights (what we Left Coast folks call expressways). Just like how you can't go from NJ to NY metro without giving PANYNJ money, or how every Hudson crossing from here to Albany requires giving government money. Granted you can take the boy out of Cali and all that, but even though you have to pay toll to drive to/from San Francisco to the Central Valley, there is a way to avoid it - it adds 90 minutes, but it's there. Just like you can avoid the turnpikes between Chicago and Philly. 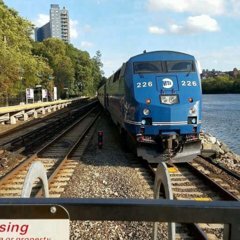 CP eliminates that option and disproportionately puts the financial burden on everyone else while minimizing it for Manhattanites and Bronxites. It's a principle thing for me - another sin tax instead of spreading the pain. I don't mind it, really. I have family in NJ and we drive there. It's gonna hurt us, yes, but I'm willing to pay that money, because driving (or really any transportation) isn't free,and we shouldn't act like it is. Especially not driving. Beyond the direct costs of maintaining a crapton of asphalt, repairing bridges, cleaning tunnels, subsidizing gas, etc, driving takes a massive social and environmental toll on those near roads. Those latter effects are concentrated in areas with traffic (think the core of Midtown), so it strikes me as only right that those using the least efficient mode of transport known to man while transiting and overcrowding roads they don't pay to maintain should have to pay *something* to use them. So I guess my question is why should driving be free? Aside from the fact every taxpayer paid for the asphalt and steel used to build roads and bridges? And the aforementioned toll schemes already in existence. If we're to turn Manhattan into Fortress NY, then I feel that just like SIers don't pay full toll on the VZ, you take that a step further and eliminate the VZ, Whitestone and Throggs Neck tolls for LI-registered cars since the goal is to, ostensibly, keep cars out of Manhattan. But even if you don't, CP is just kicking the transit funding can down the road since as soon as vehicle levels drop, you now have a new funding crisis - like every state does with gas tax revenue falling because of fuel efficiency increases. That's why a cooked food and beverage tax - or a sales tax add-on is a smarter mechanism - people will always eat out and buy sodas, juices, coffees, waters and booze. Aside﻿ from the fact every taxpayer paid for the asphalt and steel used to build roads and bridges﻿? But this is exactly my point. Whether or not we choose it, our tax dollars are channeled to driving subsidies. None of the taxes you mention create all that much of an impact on what has basically been made a mode of transport without much in the way of opportunity costs for most Americans — and this is especially true when you compare driving’s costs with those of public transit in most of America (be sure to include indirect expenses in such an analysis, ie long waits for the 1 bph route that runs a half mile walk from your house). If﻿ we're to turn Manhattan into Fortress NY, then I feel that just like SIers don't pay full toll on the VZ, you take that a step further and eliminate the VZ, Whitestone and Throggs Neck tolls for LI-registered cars since the goal is to, ostensibly, keep cars out of Manhattan. But even if you﻿ don't, CP is just kicking the transit funding can down the road since as soon as vehicle levels drop, you now have a new funding crisis - like every state does with gas tax revenue falling because of fuel efficiency increases. Toll reductions for the TN and WS are, as I said, in a bunch of the CP proposals out there. Toll reductions are still turning 2M people into ATMs. Toll eliminations give folks the option to pay for the direct route or use the bypass and take longer to get on with the journey. I'm for preserving that option. That's why I oppose CP on principle. C'mon though, that if anything--lots more than a tax on drivers who, by the numbers, are all wealthier than transit commuters--it just a regressive tax on poor people. We shouldn't even be thinking of flat taxation like that while the rich get richer and our governor refuses to even look at the millionaire's tax. You can make the case that congestion price is a regressive tax, and there's a debate about whether or not that's true, but it's a case. But something like a food and beverage tax is way, way more regressive and likely to hurt people without a lot of money at all. IC'mon though, that if anything--lots more than a tax on drivers who, by the numbers, are all wealthier than transit commuters--it just a regressive tax on poor people. We shouldn't even be thinking of flat taxation like that while the rich get richer and our governor refuses to even look at the millionaire's tax. You can make the case that congestion price is a regressive tax, and there's a debate about whether or not that's true, but it's a case. But something like a food and beverage tax is way, way more regressive and likely to hurt people without a lot of money at all. 2¢ on every dollar spent on cooked food, and prepared beverages. Paid by poor, middle class or upper class. Paid by NYers, NJers, PAers, CTers, and tourists alike. Whether it's a line item or built into the retail price like VAT/GST. No different than when your bodega raises the price of a Bagel or Bacon Egg and Cheese. And that's much easier for the poor to absorb than $11.52 per day just to go over the Manhattan up the FDR to the Bx. An $8 with tax lunch adds 14-15¢ to the bill. $100 tab adds $2. You know on some level I agree, but on another I just wanna say "tough." Yes, they'll have to pay to get out, but I don't think that we should lose sight of the fact that these people are choosing to drive through the densest area of the country. Feeling bad, IMO, is not a good enough reason for us not to make them pay for at least some of that cost. FDR is outside of the zone, so it'd technically still be possible to go from LI to NJ for free via Brooklyn Bridge, Willis Ave, 9A, Albany, etc. I don't think very many (if any) of the urban poor are commuting in cars anyway, though. Point is though, by the numbers, the poor aren't driving into the city. And that route you mentioned would still be free, cause they're leaving out the FDR. But mainly, it's upper middle class and rich people who drive into NYC. Median income of people driving into Manhattan is something like $80k or $90k a year. In Manhattan alone, median of drivers is $134k I believe. That's why the comparison is off, imo, because people without any money sure as hell are going to bodegas and delis every day, but they're much less likely driving into Manhattan. So then you're talking about them getting stuck with an additional tax at every little meal, and that does start to add up. Flat taxes like that always, always impact poor people harder, because it's a bigger percentage of their income. Same thing with gas taxes, etc. I can't say I ever like them as budget solutions. C.P. is flawed, but the line that it's ripping off middle class people doesn't quite add up. Truth be told, if I were in charge, I'd do C.P. on a tiered plan, where if you made less than ~$30k a year, you paid a lower rate than somebody who made $300k a year, and with DMV registrations that wouldn't be impossible to figure out, but that'll never happen. A "lockbox" is nice, but who really gets to keep the key? Edited December 29, 2018 by Gotham Bus Co.
That's why if CP is implemented, the VZ and the Bx-Q crossings should become free - you've now moved traffic away from Manhattan. Can't get rid of tolls on those bridges or turn them over to NYCDOT. By state law, those bridges must have tolls which must increase every two years and must be shared with the suburbs. They're about to create a law charging folks for going to Lower Manhattan - they can change the law to remove the three crossings' tolls. To be fair, those are TBTA properties. You have a good bit of bond debt that needs to be settled before you can just take them and kill their revenue stream. Also: if the objection here is that LI can't leave itself w/o tolls, what happened to Brooklyn Bridge to FDR to local roads in the Bx to points north/west? I daresay that satisfies your qualm, given that you say the +90 min route out of San Fran is acceptable in this regard. If the objection here is that LI can't leave itself w/o tolls, what happened to Brooklyn Bridge to FDR to local roads in the Bx to points north/west? I daresay that satisfies your qualm, given that you say the +90 min route out of San Fran is acceptable in this regard. That pretty much guarantees that the Brooklyn Bridge and FDR will always be moving at a snail's pace, being the only route. They are already frequently congested, and this will just make the situation worse. Knowing the , they will be dumb enough not to reroute the express buses off of the FDR if this poorly thought out plan is enacted. ﻿ Knowing the , they will be dumb enough not to reroute the express buses off of the FDR if this poorly thought out plan is enacted. Disagree. Few LIers are gonna willingly suffer through Atlantic; they'll probably bite the bullet and use 495 to the QMT as today or the LIRR. The great thing about the BB/FDR combo being the only free route is that it's so extremely circuitous for most O/D pairs that only the real "tolls are anti-American" nutcases will use it. Maybe they'll wait for the plan to take effect, see where the congestion actually is, and then reroute buses as needed. Which just goes to show that your point about a free route "still existing" is simply a distraction and farce. - Don't work in Manhattan. - Work in Manhattan, and use the transit system to get to and from work. who still need to drive from (geographic) Long Island to elsewhere, and for whom $11.52 is a significant sum of money to pay just to get from one place to another, as it would be for most transit users. You know on some level I agree, but on another I just wanna say "tough." Yes, they'll have to pay to get out, but I don't think that we should lose sight of the fact that these people are choosing to drive through the densest area of the country. ﻿Feeling bad, IMO, is not a good enough reason for us not to make them pay for at least some of that cost. Let's say we institute a new daily $11.52 tax applicable to anyone living within walking distance of the upper Culver line. It wasn't there when you moved in? Doesn't matter; there's always an expectation that the situation can change. You chose to live in that area, and it's not exactly poverty central. So you can pay it. Don't like it? Well, "feeling bad" is not a good enough reason to not make you pay that cost. The issue lies with the fact that something that was once free would become quite expensive. If I wanted to pay 3 or 4 subway fares just for going or leaving home, I'd have moved to Staten Island. But Brooklyn, Queens, and LI have historically had free options, and taking that away is indeed quite regressive.